A St. Ignatius man accused of driving drunk and striking a bicyclist causing his death last May near St. Ignatius was sentenced to the Department of Corrections for a total of 10 years with five years suspended. Nick Herak, 73, was riding his bike May 21, 2017 when he was struck by a vehicle. While authorities were still investigating the accident scene, the mother of Douglas Calvin Charlo, 48, showed up with Charlo and implicated her son. Investigators say they found yellow fabric embedded in the paint of Charlo’s vehicle that matched that of the coat worn by Herak. 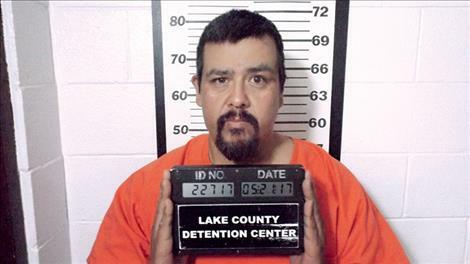 The sentence was handed down at District Court in Polson on Jan. 30 by Judge James Manley in accordance with a plea agreement. Charlo was convicted of vehicular homicide while under the influence and accidents involving another person or deceased person, both felonies. The plea agreement resulted in a misdemeanor count of duty to give information and render aid being dismissed. He was given credit for having served one day in jail. Judge Manley also ordered Charlo to pay restitution in the amount of $37,590.91 plus a ten percent administrative fee for a total of $41,349.99. Charlo also was fined $5,000 with half of that suspended. The sentence was handed down on a Tuesday, outside of Judge Manley’s regular day of law and motion which is Wednesday.